Topics within competition and consumer law including trade practices, competition law, product liability, misleading conduct and consumer law are covered by articles, case notes, book reviews and informed comment in the Competition and Consumer Law Journal. 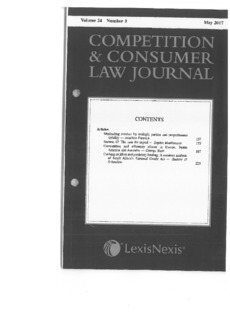 The CCLJ publishes several analytical articles per issue, generally between 4000 and 8000 words. The primary focus of this highly regarded journal is on Australian and New Zealand law; relevant international developments are also considered. The journal is peer reviewed and features a high standard of contributions from academic and practitioner arenas.